Originally published on huffingtonpost.com on July 26, 2017. Written by Emily Broad Leib, Assistant Clinical Professor of Law, Director of the Harvard Law School Food Law and Policy Clinic, Deputy Director of the Center for Health Law and Policy Innovation. This week, I am excited to join a group of advocates and chefs from Food Policy Action, the National Resource Defense Council, ReFed, and the James Beard Foundation in Washington, D.C. to put food waste on the plates of Congress. In 2015, the Environmental Protection Agency and United States Department of Agriculture announced a national goal to halve food waste by 2030, but these agencies and Congress have not yet adopted policies to help us meet this ambitious goal. We are now approaching a critical opportunity to implement such policy change: the U.S. Farm Bill, expected to pass in 2018. This legislation shapes our food and agriculture system, covering everything from rural broadband to food assistance programs—yet the last Farm Bill, enacted in 2014, didn’t put a single dollar towards food waste reduction efforts. Along with other food waste advocates, we have been working tirelessly to change that. Food waste is a drain on our economy and our environment, and reducing this waste has demonstrated triple bottom-line results: sending healthy, wholesome food to those in need, reducing the negative environmental impacts of food waste, and creating jobs and economic activity. These are the types of solutions our communities and our businesses want to see from Congress. In the absence of federal action, states can and do take the lead, and more states than ever are hard at work on finding ways to ensure more food is donated or recovered. According to our research, 20 states and Washington, D.C. have introduced over 80 unique bills to cut food waste in 2017 alone! At the Harvard Law School Food Law and Policy Clinic, we have worked with state policymakers on some of these bills, giving us the opportunity to see this exciting work firsthand. Two multi-pronged approaches that incorporate many of our top state policy recommendations come from Maine and Washington, D.C. Both would strengthen liability protections for food donors, adding protections for organizations that sell discounted donated food and businesses that donate directly to end recipients; provide tax credits for food donors; and mandate creation of guidance to simplify food donations. Maine’s bill would also create a commission to develop a statewide food waste reduction strategy. Earlier this year, West Virginia enacted a tax credit for farmers who donate food to nonprofit food organizations. Food loss on farms is particularly severe (estimates have found that more than 10 million tons of fresh produce go unharvested or unsold each year) and food recovery organizations are always looking for more fresh produce to give to those in need. Bills like this are a win-win for both consumers and farmers. Texas passed legislation this June that encourages schools to donate surplus food and school staff to take an active role in the fight against food waste and food insecurity. Food waste in schools mirrors that in consumer households—schools waste around 2 pounds of food per student per month—and bills like these could teach kids to be more conscientious about food, reshaping the next generation of American consumers’ habits. In New Jersey, draft legislation would restrict the amount of food waste going to landfills; the bill requires large food waste generators located within 25 miles of a recycling facility to compost or recycle their food waste, instead of sending it to the landfill. Five states and several municipalities now have organic waste bans like this and many have seen positive results; Massachusetts’ organic waste ban achieved a five-fold increase in waste diversion in its first year; it also created 500 new jobs and generated $175 million in economic activity in its first two years. This is just a sample of the many state laws under consideration this year. These state policies offer great opportunity to turn the tide on food waste, and the sheer number of proposed bills evidences the growing interest in addressing this massive issue. However, states can’t do it alone—especially on issues like date labelling and liability protections, in which inconsistencies across the country present serious challenges. Further, much of the infrastructure needed to recover surplus food or divert food scraps to anaerobic digestion or composting is costly, and federal support for this infrastructure can plug gaps in state budgets. It is time for Congress to take the lead and further the fight against food waste. This week Representative Chellie Pingree and Senator Richard Blumenthal will re-introduce the Food Recovery Act. This legislation presents the first-ever comprehensive attempt to support a wide range of policies that would reduce waste and increase food recovery, and would implement many of our top federal-level food waste recommendations. Consumers, businesses, and advocates across the country are pushing for change, and they’re sending a clear message to our federal government: Americans are ready and able to reduce the amount of food we waste, and the 2018 Farm Bill is our chance. Written by Talia Ralph, Summer 2017 intern in the Food Law and Policy Clinic. Once you start working on food waste issues, you start to see it everywhere—from your bleary-eyed 7 a.m. breakfast at your hotel’s buffet to the conference spread of delicious, healthy salads and wraps. Where is all this leftover food going to go? You wonder, recalling the logistical barriers you’ve been researching for weeks. How can we keep it from going to waste? At Recovering Food in the Chesapeake Region: Policies, Resources and Innovations, a day-long conference we co-hosted with our partners at Johns Hopkins Center for a Livable Future (CLF) in Silver Spring, Maryland, we clearly had some dedicated advocates in the audience. I say this not just because they asked thoughtful, in-depth questions about food waste reduction and recycling policies, nor because they presented their own clear and effective strategies and success stories of getting food waste policies off the ground. I say this because our 40-some attendees completely cleared the buffet table at the end of the day. Not a single cookie or vegan BLT wrap was left. 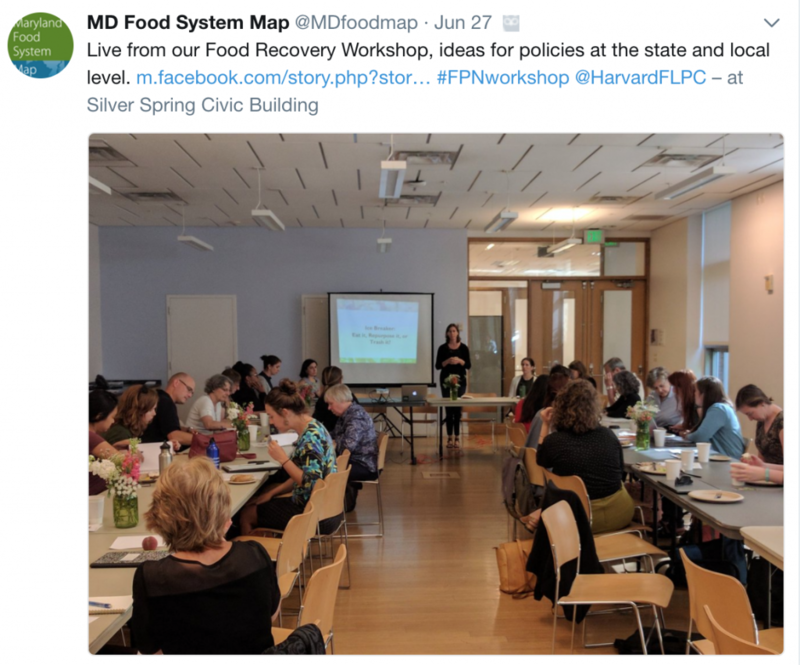 I’ve been thinking about food waste more than usual these days, given that I’ve been researching several states’ policies (or lack thereof) for the seven weeks I’ve been at the Harvard Law School Food Law and Policy Clinic. We’d practiced this particular presentation—based on the recommendations from our toolkit Keeping Food Out of The Landfill: Policies and Ideas for States and Localities and tailored to the Chesapeake region—a great deal before we arrived. It was my first time explaining legal concepts to an audience of more than one (usually comprised of either my teddy bear, my girlfriend, or my mom), and I was nervous. Sure, I’m a law student and a former Canadian National debater, but the idea of being an expert on something as multifaceted as liability protections for food donations gave me pause. For one thing, there were lots of stakeholders to consider. The restaurant owners concerned about their reputations should they be found to be donating extra food and advocates who feel that no person in need should have to pay for donated food…just to name a few. An issue that had seemed so straightforward to me before working at the Clinic—getting surplus food to people who are food-insecure is a good thing!—suddenly became alive with different viewpoints and perspectives I had never considered. Also, our audience was full of people who have been working in this space for much longer than I have. They’re on the ground every day doing food recovery and food waste reduction. What could a young Canadian food-journalist-turned-law-student tell them that they didn’t already know? As I stood up to present our recommendations about liability protections, which include extending those protections to organizations and individuals who donate food directly as opposed to through a non-profit, as well as to organizations like Daily Table who charge a nominal fee for donated food, that stress melted away. Sitting in the room were advocates who were dedicated to eradicating food waste, and their enthusiasm and experience set me at ease. They peppered me with questions I had answers to, and they offered their own perspectives. I didn’t have to be an expert—I was surrounded by experts! Ona Balkus, a former Clinic fellow now working with DC Councilmember Mary M. Cheh on sustainable policies in D.C., spoke about her experience working on the District’s proposed Save Good Food Amendment Act, which would put a ton of our recommendations into practice in the District. West Virginia Food & Farm Coalition staffer David Manthos enlightened us about the challenges of lobbying for sustainable policies in West Virginia. Brenda Platt, the Co-Director of the Institute for Local Self-Reliance, made an amazing case for composting and waste bans. CLF’s Sameer Siddiqi shared his big-picture research on food waste plans across the country, and Cheryl Kollin told us about how Community Food Rescue grew its reach in Maryland. As we headed back to the airport after a long, full day of discussion and connections, we grabbed a take-out dinner from a sandwich place in our terminal. I am pleased to inform you that nobody’s leftovers went to the trash; I had leftover salad for lunch the next day. Emily Broad Leib, director of Harvard Law School’s Food Law and Policy Clinic, recently spoke with Forbes.com contributor Eustacia Huen about expiration labels and the confusion surrounding them. The full article, What ‘Sell By,’ ‘Best Before’ And ‘Use By’ Dates Really Mean, can be read online. “Given there’s no federal regulation, consumers should be wary that these labels don’t necessarily offer a safe-to-eat date. ‘The reason companies are including dates at all comes from a valid business purpose in wanting consumers to eat food while the flavor is best,’ said the legal expert. Originally published by Bay Area Bites on June 21, 2017. Written by Jodi Helmer. California nonprofits are advocating for a medically tailored meal pilot program for low-income residents. “Food is medicine” has become a common refrain. Now a coalition of California nonprofits hopes to test this theory with a program that would deliver medically tailored meals to the doors of low-income California residents living with heart disease, cancer, and diabetes. Earlier this year, The California Food is Medicine Coalition, which is made up of six California nonprofits: Ceres Community Project in Santa Rosa, Mama’s Kitchen in San Diego, Project Open Hand in San Francisco, HealthTrust in San Jose, Food for Thought in Sonoma County, and Project Angel Food in Los Angeles—all groups that for the most part started delivering medically tailored meals during the HIV/AIDS crisis and saw the impact on patients’ quality of life—worked with state Senator Mike McGuire to request funding to pilot the program. If the coalition’s request for $9 million in funding over three years is approved, it would be the first multi-organization, multi-county, multi-disease pilot in the country—and it could have a significant impact on healthcare costs and health outcomes. Earlier work in Philadelphia, led by the nonprofit MANNA and documented in a 2013 study published in the Journal of Primary Care and Community Health, showed promising results. After delivering three medically tailored meals per day to 65 patients with different chronic illnesses for six months, researchers found that the healthcare costs for those patients dropped from $38,937 per month to $28,183 per month, and were 55 percent lower than the healthcare costs of a comparison group. The frequency of hospital admissions and length of hospital stays also declined. MANNA, like many members of the Food is Medicine Coalition, started delivering meals to those living with HIV/AIDS in the 1990s. The program expanded over time and, in 2014, thanks to a partnership with local insurer Health Partners Plans, MANNA started tailoring meals for 80 different health conditions ranging from cancer and kidney disease to diabetes and HIV/AIDS. The dietician-designed menus offered by Ceres Project feature dishes such as mushroom quiche, chickpea burgers, lentil soup, fish stew, and pasta with summer vegetables. Preparations are further tailored to specific illnesses. Meals for diabetes patients would have fewer carbohydrates while meals for patients with heart disease would limit sodium and saturated fats. All meals are based around fresh fruits and vegetables, whole grains, and high-quality proteins. Groups also allow for dietary modifications. MANNA, for example, provides pureed meals for those who struggle to chew or swallow, low spice meals, low lactose, and seafood-free meals for those with allergies. A 2016 study found that home-delivered, medically tailored meals helped cancer patients decrease fatigue, eat more nutritiously, and live more independently. And the Harvard Center for Health Law and Policy Innovation has reported that medically tailored meals help lower blood glucose levels, reduce the number of hospitalizations and ER visits, and increase medication adherence among those with diabetes. Harvard’s study also showed that providing three meals per day for six months costs less than a single night of hospitalization. The opportunity to improve health outcomes helped MANNA secure partnerships with three insurers. The nonprofit operates out of a new commercial kitchen with 36 staff members and 4,500 active volunteers to deliver meals to roster of 1,000 clients who receive 1 million meals annually. “There is finally recognition that a prescription diet is just as important as prescription medications,” Daugherty says. While MANNA secures its funding through a number of channels including contracts with insurers, individual donations, foundations, and corporate giving, the Food is Medicine Coalition hopes to have funding embedded into the state budget and will then allocate resources to patients receiving public health insurance through Medi-Cal, California’s implementation of Medicaid. According to Couch, the program has the support of the California Department of Public Health, California Department of Healthcare Services, and other key stakeholders. Couch believes the intervention is critical for supporting patients but admits there are still logistics to work out. The goal is to have Medi-Cal refer patients to local organizations such as Mama’s Kitchen and Project Open Hand, which can deliver the meals in their respective counties. As part of the pilot, the coalition will track health care utilization and health outcomes before, during, and after the intervention. Couch estimates that a $9 million investment would shave $19 million in healthcare costs during the first year of the program. Thanks to their dogged determination, the coalition received good news: In June, members of the state Senate approved $6 million over three years to pilot the program. While the Assembly did not include funding in its budget, the joint Conference Committee on the Budget voted to include the funding in the final budget. The budget is expected to be ratified today, and will go to the governor’s desk soon after. There is still a chance Brown could veto the expenditure, but Couch is hopeful.